The reopening of the Tyne Pedestrian and Cycle Tunnel has been pushed back yet again. Renovations to the historic river crossing between Jarrow and North Tyneside were supposed to have been completed in the New Year, but the finishing date was later put back until this month. Now, bosses on the scheme have confirmed it could be June before it is in use once again – four years later than originally planned. 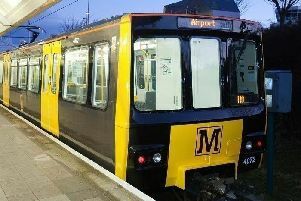 In a statement, a spokeswoman for Newcastle City Council, which manages the tunnels on behalf of the North East Joint Transport Committee (NEJTC), said: “Re-opening is scheduled for late May/early June 2019. “The tunnels are 95 per cent complete but we have a few technical issues with the installation of the inclined lift which we need to resolve before we can confirm the final date. “This is the final key part of the project and relies upon specialist contractors. “Once this is complete and the lift has been thoroughly tested, we’ll be able to announce the official re-opening date. The pedestrian tunnel under the Tyne opened in 1951 and took four years to build at a cost of £833,000. But the project has been dogged by problems since a decision to renovate it was made a decade ago. The tunnel was supposed to reopen in 2015, following its closure for restoration in 2013 – meaning refurbishment has taken longer than the initial building project. Progress was slowed almost immediately, following the discovery of asbestos and in 2015 the original contractor, GB Building Solutions, went into administration. The North East Ccombined Authority then took over responsibility for the project but faced even more problems, including issues with suppliers and another contractor working on the scheme, Vaughan Engineering, also entered administration. And in that time costs have ballooned from an original budget of about £6.9million, to an expected final cost of £15.65million. According to a report prepared for the NEJTC meeting, bosses have considered scrapping the project. But it was decided the work needed to make the structure safe, especially in light of its listed status and asbestos contamination, meant this would only lead to small savings. Members of the NEJTC admitted that after being closed for so long it may now be a challenge to get the public using the tunnels once again. Coun Gladys Hobson, the committee’s chairwoman, said: “After having been closed for so long we’re going to have to really market these tunnels. “This is a listed building and we’ve had to be very careful.